Will Unbundling Kill Higher Ed as We Know It? 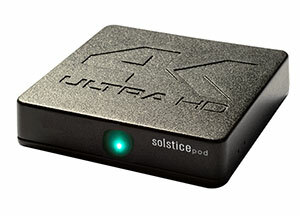 Mersive today introduced the Solstice Pod, a wireless media streaming device for video collaboration. The company has loaded its Solstice software onto a small Android hardware platform, creating an all-in-one collaboration tool that can be moved from room to room as needed. The Pod allows multiple users to connect, share and control content on any display. Native support for touchscreen and 4K displays. The Solstice Pod can be integrated into an existing network or deployed as a "drop-in" solution using its built-in wireless access point capabilities. The device is priced at $799 for the Small Group Edition version and $999 for the Unlimited Users version. For more information, visit the Mersive site.